I can’t believe January is already just about over. This month went by pretty fast and I had decided to do a character spotlight on these characters since the beginning of the month. The Blue Thieves are an enemy in the Spyro games. They first appeared in Spyro the Dragon (1998) and have most recently appeared in Spyro: The Reignited Trilogy (2018). These little guys are exactly what their name is. They wear blue robes that covers them from head to toe, not even revealing their face. It makes them look pretty creepy, but they’re voice counters that. They’s also thieves (duh), stealing dragons eggs, gems, and other important items you need in the Spyro games. As Spyro, you chase them around certain areas of the levels and either ram into them or breathe fire on them to make them stop and drop whatever it is their holding. I had forgotten about these characters until Kris started playing Spyro: The Reignited Trilogy. Their updated graphics are great and their voice is hilarious. Until Spyro starts chasing them, they taunt you by saying, “Nah-nah-nah-nah-nah!” and then laughing. I find this absolutely hysterical and I love these characters. They don’t do much, they’re bad guys, and they’re in most levels for just a few minutes (or until you catch them). But hearing them make fun of you from afar and laughing makes me laugh and I could listen to it all day. The Blue Thieves are such small characters, but they definitely deserve to be in the spotlight some. They certainly made things interesting and gave you one more challenge throughout the Spyro games – even if they were fairly easy to catch most of the time. Do you remember the Blue Thieves? Have you played the latest Spyro game? Let me know in the comments below and if you enjoyed this post, please share it around! Merry Christmas and happy holidays, everyone! Here’s hoping everyone had a wonderful holiday filled with good times, good family and friends, and presents. This was a pretty low-key Christmas for us, our immediate family opting to just exchange a few gifts together. The main video game I had received was the Spyro: Reignited Trilogy for the Xbox One. The Spyro trilogy was one of the few games I had for our old original Playstation years ago, so it’ll be fun to go back to that world and see how well it’s been remastered. I haven’t heard anything bad yet about the new game. I was also surprised with the complete soundtrack of Octopath Traveler, imported from Japan. Thankfully the little booklet inside the cover has the English names of the songs, as they’re all listed in Japanese on the back cover! I’m excited to get back to Spyro as well. Plus, listening to the soundtrack, there are four CDs to it! The main video game I got was the Lego Harry Potter Collection for the Nintendo Switch. This game came out in October and I’ve never played any of the Lego Harry Potter games before. Having all seven in one game will be a treat and I can’t wait to finally go to Hogwarts. I also got two packs of Pokemon cards – one had a jumbo Tsareena card, which I was excited about. Tsareena was on my main team in Pokemon Sun & Moon. The other pack had a Pokeball card holder to go along with Let’s Go Pikachu and Let’s Go Eevee. I also got the game guide to those games as well. I also got Rachel a Mimikyu doll that the dog thought belongs to her, haha! Aside from those games, we’ve also each gotten an eShop gift card which I’m planning on using to download Gris on the Nintendo Switch. I’ve had my eye on the game for a while, so it seems like the perfect game for the end of the year. Our grandparents gave us some cash, and I already spent mine on the new expansion pack — Get Famous — and a couple of stuff packs for the Sims 4. We have plenty of games to keep us occupied for a little while… At least until the new year! I also got a new Monopoly game, the Cheater’s Edition. The point is to cheat and not get caught… but I kind of do that in regular Monopoly anyway. So I’m hoping the game will be a blast. However, I know people are expecting me to cheat, so it’ll be more of a challenge. We do have plenty of games to keep us busy for the new year and I know so many new games are going to come out in 2019. I can’t wait to dive into our new games! Did you have a good holiday? Any new games on your list? Let us know in the comments below! The holidays are coming, with radio stations already playing Christmas songs and the scent of snow in the air. Mom is already asking us to fix up our Amazon wish lists, and she’s a little annoyed that we tend to pre-order our games nowadays, haha! This game is coming today! Rachel and I have been waiting for this game to come out since it was first teased. It’s a major nostalgic trip for me, seeing as Kanto was where I started my “Pokemon journey” a couple of decades ago. We’re hoping the co-op mode will be tons of fun! Who isn’t waiting for this game? Admittedly, much of the surprise and speculation seems to have already been shown off and/or leaked onto the Internet, but I’m still looking forward to seeing how this game plays out. While I’m also not looking forward to shelling out extra cash for additional DLC characters, I am very curious as to who else is going to be on the roster. Gris just looks to be one of the prettiest video games we may ever see. It’s boasted as being a platform game with no enemies or lives. Rather, your character explores the beautiful scenery and puzzles, being in tune with their emotions after going through a difficult experience in their life. We are not PlayStation girls. We grew up mainly with Nintendo consoles and, even now, we have an Xbox One that we turn on occasionally while our PlayStation 3 that was generously gifted to us from a friend has yet to be powered on, despite how long we’ve had it. Nevertheless, we did have the original PlayStation and the original Spyro trilogy. If memory serves me, we enjoyed being the little, sassy purple dragon, so I think it’ll be fun to play the games again! What holiday releases are you looking forward to? Another month has come and gone, which means that it’s time for another character spotlight. Today, I’m talking about an old school guy who has made a comeback recently. Spyro is nostalgic for me. I remember playing his games on the Play Station way back when. He’s always had a soft spot in my heart mainly because he’s so cute. 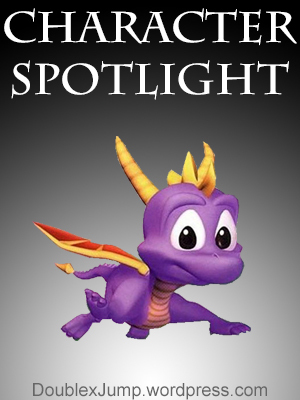 He was first introduced in 1998 Spyro the Dragon for Play Station. His series continued in Spyro 2: Ripto’s Rage and Spyro: Year of the Dragon. The Legend of Spyro, released in 2006-2008, was a trilogy of games that was supposedly a rebooted version of the previous games. Most recently, Spyro has appeared in the Skylanders series (2011-2016). I was excited to play Skylanders when it was first announced because I remembered Spyro from my childhood. However, Spyro wasn’t the same. They had changed him, but I enjoyed his character all the same. He’s still a cute, purple dragon to me. And, while I didn’t play the Skylanders game for very long, I thought it was a good game. It’s still something I plan to get back to at some point, but now I’m six games behind, so… Who knows? Still, I’ve always loved Spyro and I would love to try the original games again sometime. Do you remember Spyro? Did you play the games? Let me know in the comments below! How was everyone’s week? Anyone got some nice new or old games that they’re playing? Spyro the Dragon originally came out for Sony’s PlayStation back in September of 1998 in North America and was released about a month later for Europe. It received generally positive reviews, mostly for the game’s graphics and it’s high replay value. The game has the player take control of Spyro, a small (but don’t say that to his face) dragon with a little dragonfly sidekick named Sparx. Spyro was a snarky fellow with an amusing script and fun moves. The main objective is to explore various realms with hub worlds to rescue Spyro’s fellow (normal-sized) dragons and collect treasure from the nefarious Gnasty Gnorc. As Spyro, the player defeated enemies by using charging with his horns or breathing fire, with Sparx helping to collect treasure and being a visual indicator via different colors for Spyro’s health. Each realm had specific goals for Spyro to meet before he could move onto the next one. Meeting these goals was the minimum action needed to move on and eventually Spyro would gain access to Gnasty Gnorc’s lair. Defeating Gnasty Gnorc would roll the credits and a cinematic movie ending before allowing the player to return to the game to finish collecting dragons, treasure, and dragon eggs to 100% the game. Since the original Spyro the Dragon, there were two sequels for the PlayStation 2 along with a handful of spin-off Nintendo GameBoy Advance games. Interestingly enough, he is also heavily featured in the Skylanders series. Have you played the Spyro series? What did you think of them?